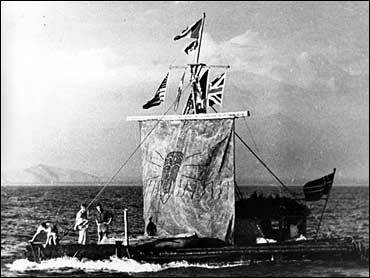 Nearly 60 years after Thor Heyerdahl sailed his Kon-Tiki balsa raft across the Pacific to prove a theory about ancient mariners, a team that includes his grandson plans to recreate the 101-day epic voyage — although the craft will have solar panels, a satellite navigation system and a link to the Internet. In 1947, Heyerdahl and his team sailed a raft with the most basic of equipment 4,900 miles from Peru to Polynesia to demonstrate that prehistoric explorers may have migrated across vast stretches of ocean. Heyerdahl, who died at the age of 87 in 2002, documented the harrowing voyage in the best-selling book "Kon-Tiki" and in an Oscar-winning documentary film. The new team, backed by Norway's Environment Ministry and endorsed by the Kon-Tiki museum, hopes to follow the route of the epic voyage aboard a balsa raft named for Tangaroa, the Polynesian god of the ocean. Although the Tangaroa will be primitive, expedition member Inge Meloey said Monday it will showcase modern technology. The cabin roof will have solar panels affixed to it to generate electricity, he said, and the raft will have satellite navigation and communications, and will be able to transmit Internet updates throughout the voyage, set to start April 28, 2005. "Kon-Tiki is one of the world's best-known expeditions," said team leader Torgeir Saeverud Higraff, a teacher and journalist, at the Kon-Tiki museum in Oslo. They wanted to carry on Heyerdahl's tradition, he said. Added Meloey, 29: "It is difficult to follow in the footsteps of your childhood hero." Higraff, 31, said changes in the environment caused one of the greatest challenges to the $900,000 expedition even before it started. The rain forest in Peru where Heyerdahl harvested his balsa logs is gone, he said, and the river he used to float them to the sea has slowed to a trickle. The team plans to cut balsa trees in a nearby forest, starting in December. The crew plans to take the same amount of time as the Kon-Tiki and, as on the first trip, the sailors will include five Norwegians, a Swede and a parrot. The team wants to honor Heyerdahl and to draw attention to environmental threats on land and at sea. They plan to take scientific samples along the way, test new theories on ancient navigational techniques, and contribute to Norway's centennial celebration of its 1905 independence from Sweden. "I had to say yes, to satisfy my sense of adventure," said Olav Heyerdahl, the famous Norwegian's 27-year-old grandson, who spoke near the original Kon-Tiki raft at the museum. The younger Heyerdahl — a carpenter, building engineer and diver — will be responsible for constructing the raft and maintaining it during the trip. At a news conference, the late adventurer's son, Thor Heyerdahl Jr., said his father would have been delighted by the project and "his own grandson being part of it would have made him very happy." The Kon-Tiki was largely subject to the whim of wind and currents because it wasn't possible to sail it against the wind. At the end of its journey, the raft crashed onto a reef because the crew couldn't change course. The modern adventurers have found techniques for steering the boat that they hope will make it possible to guide it exactly where they want to go: Tahiti. Meloey said they are also using all available technology to reduce the risks, but crossing 4,900 miles of water on a raft "cannot be done without danger." The Kon-Tiki trip had been intended to support Heyerdahl's theory that the South Sea Islands were settled by explorers from pre-Incan South America. The prevailing theory is that Polynesia was settled from Southeast Asia. The new team includes Swedish photographer-filmmaker Anders Berg, 41, and Norwegian biologist Dag Oppen-Berntsen, 44. A sixth member is being sought, but the qualifications are likely to rule out most applicants: "A Norwegian to handle navigation and sails. A real Old Salt."